Where did you go to nursing school? I went to Idabell Firestone School of Nursing, Akron City Hospital, Akron, Ohio. Graduated Dec. 1979:nurse: makes me old. BS Health Sciences Chapman University Aug 1989. Any other ACH graduates? Would love to hear from you! University trained RN's or Hospital Trained, which would you prefer? I'm diploma educted and wouldn't trade that experience for any thing! Thank the Lord that the program was available to me otherwise I wouldn't be a nurse. I later went on to obtain BS in Health Sciences. As, professionals we are learning everyday. Life is an ongoing education. 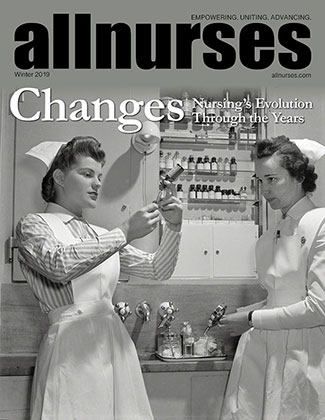 What ONE change would you make to increase nurse retention where you work? I would like to see massage offered, especially during or after a 12hr shift. Just the shoulders and back. Some of those other ideas sound pretty good. After working at my hospital for 20 plus years, I finally am off every Sunday, :rotfl: work every other Sat. All staff nurses work every other weekend up thru 20 years senority. And then can cut down when staffing allows. Also, I've been able to do combo 8hrs and 12 hrs. Hello all, I've just joined and don't really know what to say at this point. I'm not sure what the subjects are or where this will lead. I work part time in a telemetry unit. I am in my 25th year of nursing. I have been married for almost 24 years. My husband and I have adopted 3 daughters with some special needs, some physical, some developmental. Ages 16,17,20. We have 5 dogs, one for each of us. My goal for our future is to be able to travel and see this country and maybe some others. The trip that I want do next is visit the east coast during the fall to see the fall colors with our girls. We have to come up with a solution for the care of the dogs while we travel. I like to read when I have time and just finished The Wedding by Nicholas Sparks. I like to go to dinner and a movie night with the group from work about once a month. It's been difficult these last few weeks as we have lost two co-workers. One to ALS and one for unknown reasons at the age of 39. Didn't show up for work one day. Still a mystery! The other important part of my life is my belief in Christ as my Savior. :) He has given me the foundation to be able to endure all the difficulties that we have had to endure. The events that have made me stronger. My goal for this site is for education(learning is an ongoing process) :chuckle and connecting, networking with like-minded people. Well, I guess that's enough for now.